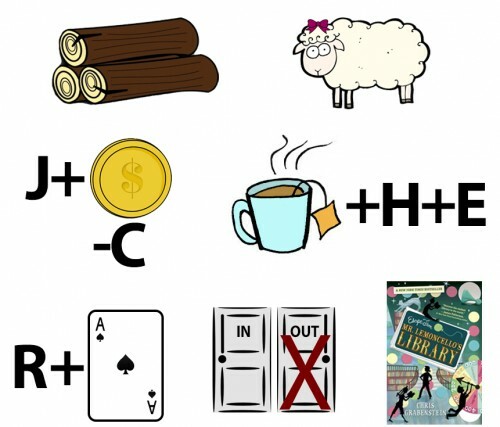 Rebuses like this one play a key role in the book, along with all kinds of other fun puzzles. And it’s up to the kids in the story to piece together all the clues and find the ultimate solution — in order to win the ultimate prize! In Escape from Mr. Lemoncello’s Library by Chris Grabenstein, a bunch of middle schoolers are selected to spend the night at their new town library, which has been designed by the world’s most famous game creator. At first, it just seems like an awesome sleep-over, with snacks and games. But then the real purpose of the party is revealed: The kids are invited to compete against each other in a battle of wits. They’ll be locked in the library for another day and night, and they’ll need to solve a series of riddles and puzzles in order to get out. First one to escape wins major fame! I enjoyed every moment of this book. I’d highly recommend it for fans of The Puzzling World of Winston Breen and Jeremy Fink and the Meaning of Life. Like those books, this is a caper where the reader can collect clues and make his/her own guesses along the way. You’ll also like this book if you enjoyed The Candymakers or Floors, which are also about kids exploring fantastical, wacky buildings. (Hint: What follows is Karen’s answer to her question.) Yes, Karen would! I read that book! I loved it so much! What was your favorite part Karen? Mine was definitely when Charles got kicked out. That was hillarious! “Did Joey Pigza lose control? Was Ella enchanted? Oh, and by the way, I figured out your little code thing. It’s “Wood ewe join the race in Mr. Lemoncello’s library?” Is that correct? Yes, I loved the book, and my kids loved it, too; I’m a children’s librarian. I’m putting together a Chris Grabenstein display, and I’d like to include the rebus puzzle you created in the case for the kids to decipher. Could you give me permission to do so? (I’ve already got a couple of program kits from Random House that I’m planning to run this fall, but I’d like to warm them up with a passive rebus puzzle display first.) Many thanks!